In what was expected to be one of the games of the tournament, favourite Geelong and Corio shared the points in a three-all draw at Hume Reserve on Sunday night. The scoreline was only part of the story as Geelong finished with nine men after Steve Vangelovski and Patrick Colliar were sent off. Geelong got the perfect start when Ben Ward caught a square Corio defence asleep and chased down a long ball forward before beating keeper Alec Kitanovski in the 5th minute. It took Corio till the 23rd minute to get on terms. A corner on the right was cleared but only to Paul McGlounan who lobbed it back in and Vangelovski got the last touch before the ball entered the net. Six minutes later there was another scramble in the Geelong goal area and McGlounan could not get enough purchase on his shot to give Corio the lead. Somehow the ball was hacked clear and belted downfield, where Jasmin Ikanovic was in the clear. The stocky striker ran on to score Geelong’s second goal. Four minutes after the break Ikanovic was again involved heading against the woodwork and Alan Paleka knocked in the rebound. At three-one ahead Geelong should have closed out the game but Corio had a good break down the right wing ending with a cross which McGlounan converted. 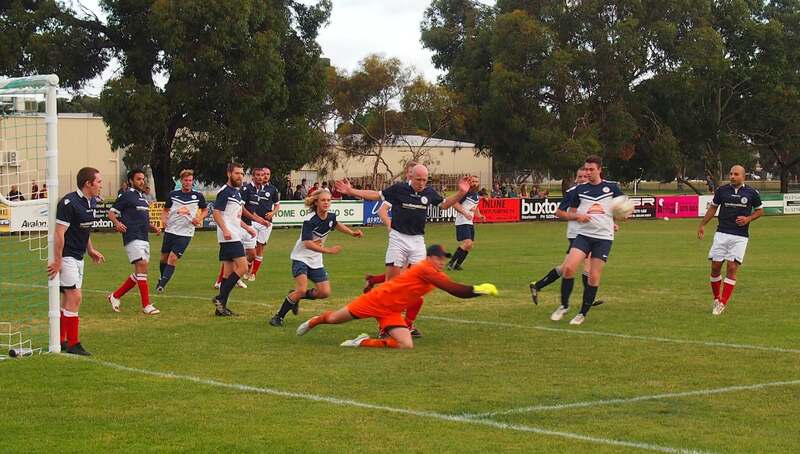 There were signs of panic in the Geelong defence and keeper Sam Versace handled the ball outside his own penalty area only for Steve Luczo to put the resultant free kick just over the bar. Then with fifteen minutes left to play there was another incident in the goal area and the referee, Steve Kolar, awarded a penalty and sent off Vangelovski for his second bookable offence. Jordan Swaney blasted home the penalty kick. The pressure on the Geelong backline was growing and Patrick Colliar was sent off for an overzealous two-footed challenge out on the touchline. Geelong made a series of substitutions and coach Mike Cooper instructed the remaining outfield players to regain the shape they had been practising in training. 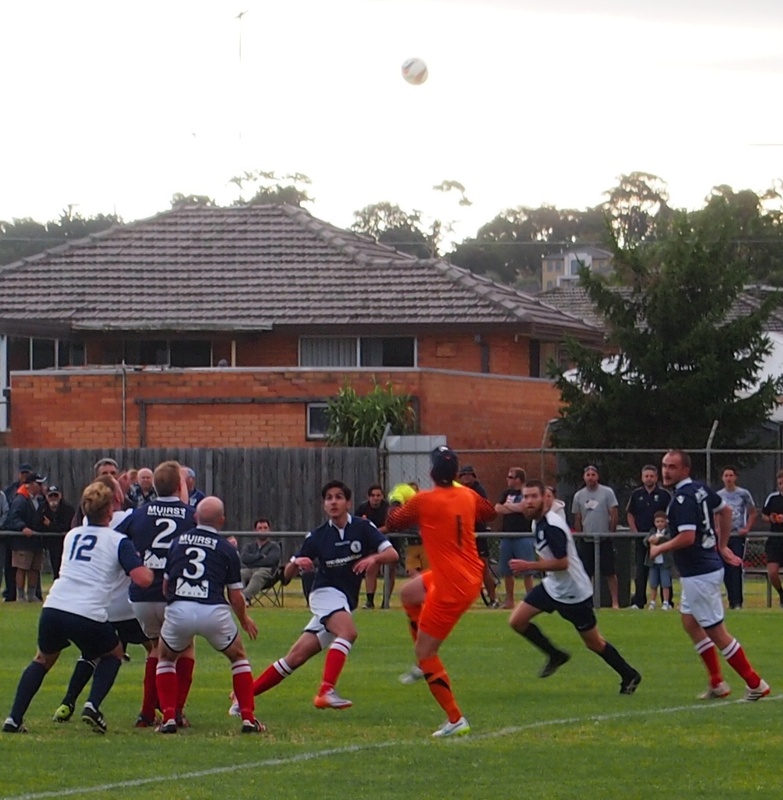 The message got through and Geelong saw out the rest of the game without conceding another goal. Corio’s players would have been disappointed that they did not take advantage of their extra numbers in that last 12 minutes. Rangers keeper Hayden van der Chys punches clear as Ronnie Clayson covers him. In the early game, Geelong Rangers recorded its first win of the tournament by three goals to nil against Lara. 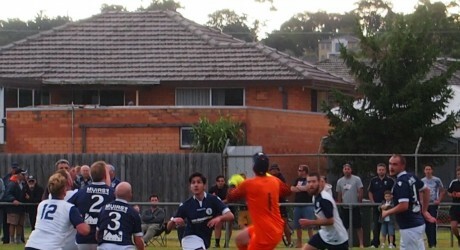 Panagiotis Vasilieu, Andrew Maclean and Mathias Gorosito scored for the dark blues. Lara had an excellent spell of pressure towards the end but could not break through for a goal despite several set pieces involving free and corner kicks. Waiting for the ball to drop. 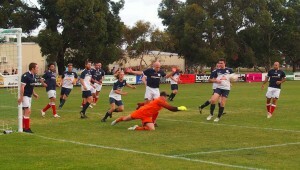 Geelong Rangers defends one of a series of corner kicks. Next Friday Corio plays Lara in the early game at 6 pm, followed by North Geelong Youth against Geelong at 7.20 p.m. The round robin concludes on Sunday with Bell Park against Geelong Rangers followed by Lara versus Geelong.